Bond Falls in Ontonagon County is one site of a Michigan Natural Resources Trust Fund project to construct all access walkways and other features. As 2016 winds down, the Michigan Department of Natural Resources concludes its year-long celebration marking the 40th anniversary of the Michigan Natural Resources Trust Fund. Since its inception in 1976, the Trust Fund has bankrolled more than 2,000 projects, providing funding to local units of government and the DNR to purchase land and land rights or developing outdoor recreation projects. The fund is administered by the DNR. The program was initially funded with state proceeds from royalties derived the sale of oil, gas and minerals and from leases. Today, recreation projects and land acquisitions are financed from investment income generated from the fund. So far, more than $1 billion has been granted to local units of government and the DNR for land purchases or recreation projects—big and small—in all 83 Michigan counties. DNR officials say they are just as proud of the numerous small and local grants they’ve awarded as the bigger, headline-generating, multi-million-dollar land acquisitions. The DNR Pocket Park in Escanaba in Delta County was funded with Michigan Natural Resources Trust Fund dollars, providing outreach and education to the public. In fact, the Trust Fund Board several years ago created two initiatives—the small acquisition grant initiative and the small development grant initiative for small projects—$100,000 or less for acquisition and $50,000 or less for development. “For several years in a row, the Trust Fund Board chose to fund all applications under those initiatives,” DeBrabander said. Local projects make up a significant portion of Trust Fund grants annually. DeBrabander said even a small project, like new restroom facilities in a local park, can make a big difference. 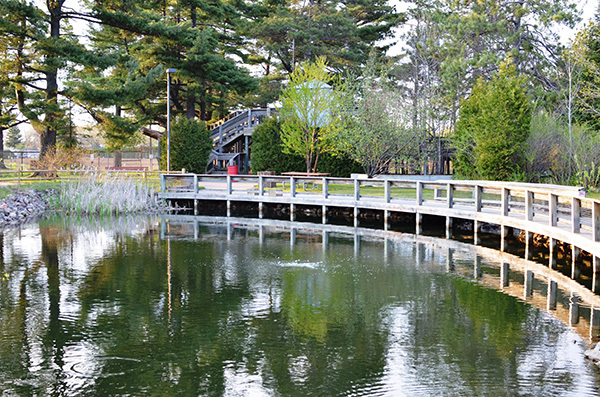 A 2014 grant to the city of Wakefield in Gogebic County, for work at Eddy Park on Sunday Lake, is a prime example. The grant funded rebuilding and remodeling the park restroom as well making the pier at the lake and the restrooms accessible to all. In Republic in Marquette County, Republic Township supervisor John Ulrich said the money from the Trust Fund enabled the township to develop a new campground on land the township bought in 2004, but had been sitting vacant for a decade. The township purchased pit toilets for the site, installed an RV dump station, and helped build the water system with its grant. The township, which has been economically challenged since the Republic Mine closed in the 1990s, hopes the campground will help reinvigorate the community. 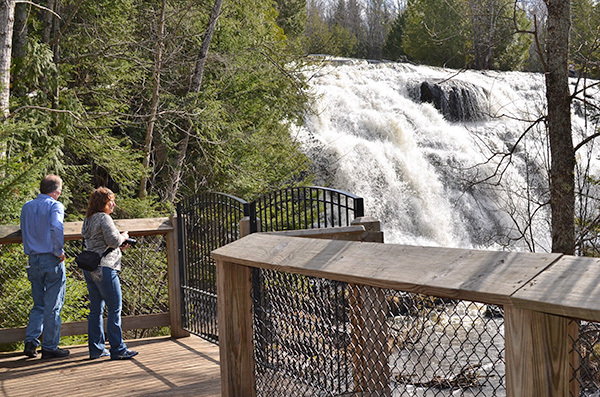 Ulrich said the campground will attract vacationers and tourists; people who want to hike the Iron Ore Heritage Trail or view the old mining site as well as those who come to fish in the Michigamme River Basin or even visit the beach. Of course, not all local Trust Fund grants are small. 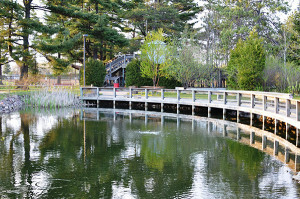 Clark Lambros Park in Marquette – the dream of a late, successful businessman – would not have become a reality without the grant, said Michele Butler. Butler, Lambros’ significant other, said he had a piece of land on Lake Superior valued at $1.1 million that he wanted to donate to the city for a park, but the city couldn’t afford to develop it. So after Lambros died, Butler approached the Trust Fund with a proposal – to sell the land to the city for $812,000, which the Trust Fund provided, with the difference in the value to serve as the local match. Butler then donated the proceeds from the sale for development of the park. Butler, who is active in the Lambros family business – Vango’s Pizza and Lounge, the oldest restaurant in Marquette – said she’s delighted in how things turned out. Gov. Rick Snyder visited the park this past summer and commemorated the Trust Fund 40th anniversary there, touring the site with Butler and members of her family. “Many of those acres are the result of Trust Fund grants and some of the development was funded by the Trust Fund,” she said. “We’ve had four acquisition grants and three development grants. Local projects can have an impact on people statewide. Josh Zuiderveen, who was a consultant for Algoma Township, just north of Grand Rapids, said the West Michigan Archery Center, an archery education and practice facility, is bringing in visitors from all over the state. “It was the better part of a million dollars and the Trust Fund did most of the heavy lifting,” he said. Although some local projects spur economic growth, many simply improve the local quality of life. Ralph Reznick, the village president at Dimondale in Eaton County, said a Trust Fund grant turned a vacant piece of land on the Grand River where folks walked their dogs into Danford Island Park, which is a center of activity. The village used grant money to build a bridge to the island across the river, create better access to the area, and install a universally accessible canoe/kayak ramp. “The use that area is getting just jumped exponentially,” Reznick said. “Dog walking has increased so much that we’re trying to develop a dog park. People from the state office building go there to eat their lunch. It’s not uncommon to see people taking graduation pictures there, wedding pictures there – it is getting tremendous use. Reznick said the community had been trying to raise money to develop the park, but, because of the Trust Fund, all they needed to raise was the 25-percent match. Get more information on the Michigan Natural Resources Trust Fund, including project and acquisition lists, upcoming deadlines and more at www.michigan.gov/mnrtf.